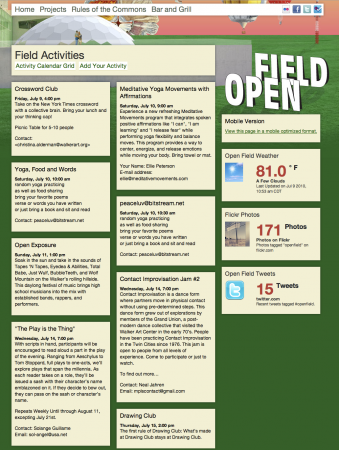 For Walker Open Field, we wanted a way to collect community submitted events and display them on our site. We have our own calendar and we discussed whether adding the events to our internal Calendar CMS was the best way, or if using an outside calendar solution was the direction to go. In the end, we decided to do both, using Google Calendar for community events and our own calendar CMS for Walker-programmed events. We use Google’s Calendar app to contain the calendar for the community events. When Shaylie gets the email about a new event, she reviews it, follows up on any conflicts or issues, and then manually adds it to google calendar. We toyed with the idea of using the Calendar API to create a form that would allow users to create events directly in the calendar, but decided against it for two reasons. First, it seemed overly complicated for what we thought would amount to less than 100 events. Secondly, we would still have to review every submission and it would be just as cumbersome to do it after the fact rather than beforehand. We also use Google Calendar to process our own calendar internal calendar feed. The Walker Calendar can spit out data as XML and ICAL. We have our own proprietary XML format that can be rather complex, but the ICAL format is widely understood and Google Calendar can import it as a subscription. This is our feed for Open Field Community Events. Since version 2.8, WordPress has included the most excellent SimplePie RSS/ATOM parsing library. As the name would have you believe, it is pretty simple to use. To pull the data out of the Google Calendar items with simplePie, you extend the SimplePie_Item class with some extra methods to get that gd:when data. Once this is done, you can simply take the $cals array and loop through it in your theme as needed. Parsing the google calendar feeds is not an inexpensive operation, so you may wish to use the Transients API in WordPress to cache this information. Overall, this approach has worked well for us. We have run into some issues where the Google Calendar ATOM feed would show events that had been deleted. Making sure to set the futureevents and singleevents paramaters fixed this. We also ran into some issues using the signleevents, so we ended up manually creating occurrences for events that would have otherwise had a repeating structure.